Episode 03 of ARIA the Origination is by far the episode I liked the least, but it is packed with some very good stuff relating to the real-life Venice, too much stuff in fact that it is impossible to do it in one entry. The focus of the episode was restoration and reconstruction. The below image, seemingly insignificant was played during the OP. Unfortunately, I do not have a picture but I saw the exact same thing on the northern shoreline of Venice, how the bridge was reduced to half width while resurfacing was done half at a time. The Chiesa di Santa Maria della Salute also makes an appearance, minus the two spires at the back! The surrounding structures are also all under restoration, unfortunately also closing the longest traghetto gondola ride. The Palazzo Ducale (Doge's Palace) was seen as being under restoration. When I went, the exterior was luckily not under restoration but given the pristine condition of it compared to the other Piazza San Marco structures which needs an urgent clean, the Palazzo Ducale obviously receives very close attention. 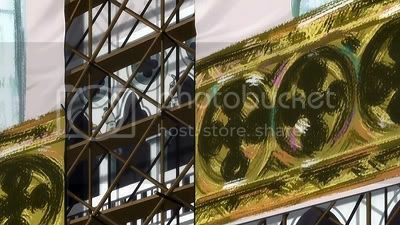 Other buildings under restoration in prominent locations (such as a hotel on the Grand Canale) have put photoreal images covering the scaffolding to show people what the building actually looks like, slightly different but still similar to what was seen with the Palazzo Ducale in the Origination. Going back to an earlier blog post, the Palazzo Contarini del Bovolo is also currently under restoration. It looked a rather sorry state and really needs it! Last but not least, the Accademia Bridge. Made of wood, I think it's the prettiest of the 3 bridges spanning the Grand Canal. 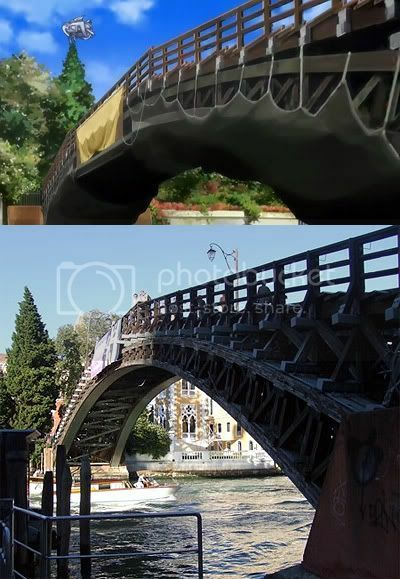 This bridge also *should* have made an appearance in Episode 06 (it was used in the manga) but was replaced with a generic wooden bridge. You can see the one disadvantage of widescreen - the producers stretched the bridge sideways to make it fit! Wow, another good post, and so quick after the last. Like there was no update for almost a month, then now 2. Anyway, there are 4 bridges over the Grand Canale, and I hears that the new bridge looks really out of place. Is that true? Have they been fully restored? Or are they still in the restoration process. 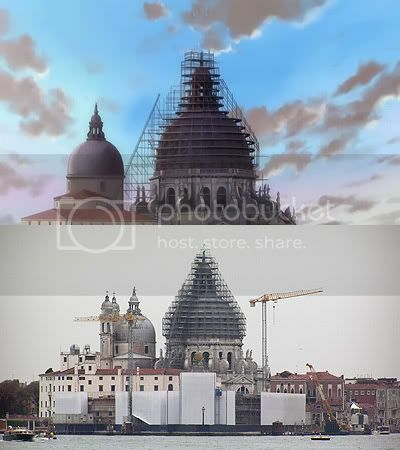 I would like to see them without the scaffolding, when I do visit Venice. The longest time I left between updates is 6 days so far I think! I went on a small holiday and did not feel like leaving this dead for over a week, so I posted just before I went, and almost missed the train! I think there will always be buildings in restoration at one time or the other. Venice is one huge old city needing constant care or else it'll crumble.